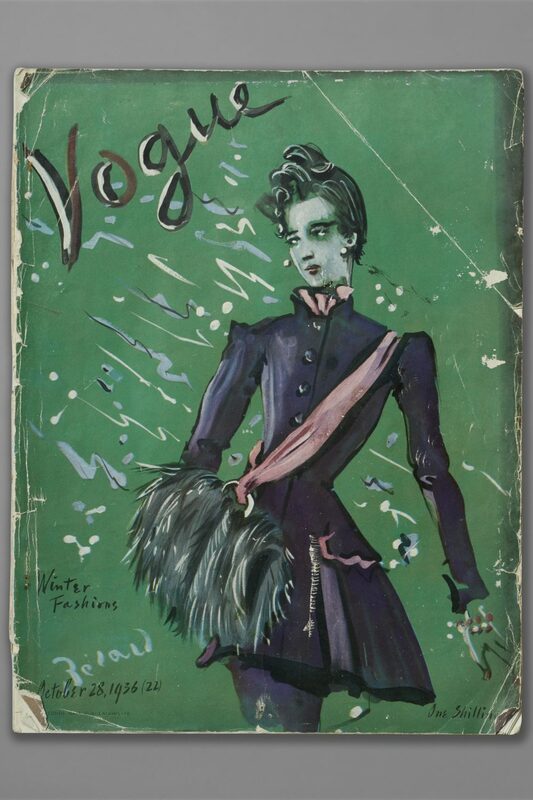 The magazine Vogue, published by Condé Nast, was the preeminent disseminator of high-class fashion to the public from the early 20th Century. Recognising that a magazine was sold by its cover, Condé Nast employed talented graphic artists and, from 1932, photographers to produce stylish and witty covers reflecting the artistic trends of the day. Adventurous in their composition and colouring, these covers often incorporated humour in the form of visual puns, of which the masthead was a part, – a far cry from the formulaic shots of celebrities and supermodels today. With this vivid design of 1936, the artist Christian Bérard helped to hold back the incoming tide of photographic Vogue covers. The eccentric Bérard turned his hand to many forms of design and illustration, and moved easily between the smart aristocratic circles and the creative bohemian worlds of Paris. Many of his covers reject any sense of a physical setting to place his model against a plain, strongly-coloured, non-naturalistic ground, with the masthead scrawled diagonally across the top left corner. The artwork for this cover shows that it originally had a canary yellow background, and the outfit a light grey sash. In his book The Glass of Fashion Bérard’s friend the photographer and fellow designer, Cecil Beaton, praised his talented use of colour ‘He revaluated all sorts of colours and by bringing them together in unusual combinations could create an effect that was entirely his own…. and by placing a particular pastel mauve or baby pink in conjunction with a deep plum colour or dark emerald green he gave the pale shades a great force of impact’. 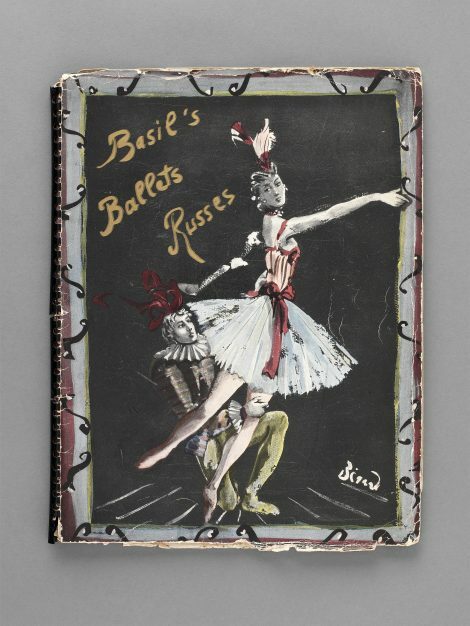 The John Bright Collection owns a programme for Col. De Basil’s Ballets Russes’ appearance at Covent Garden in 1937, the cover of which is also designed by Bérard (see Related Items). He worked widely in theatre and ballet, and here it can be seen how he translated the style of his fashion images into these fields. Two ethereal figures are placed against an almost featureless black ground, with ‘Basil’s Ballets Russes’ added by hand across the top left corner. 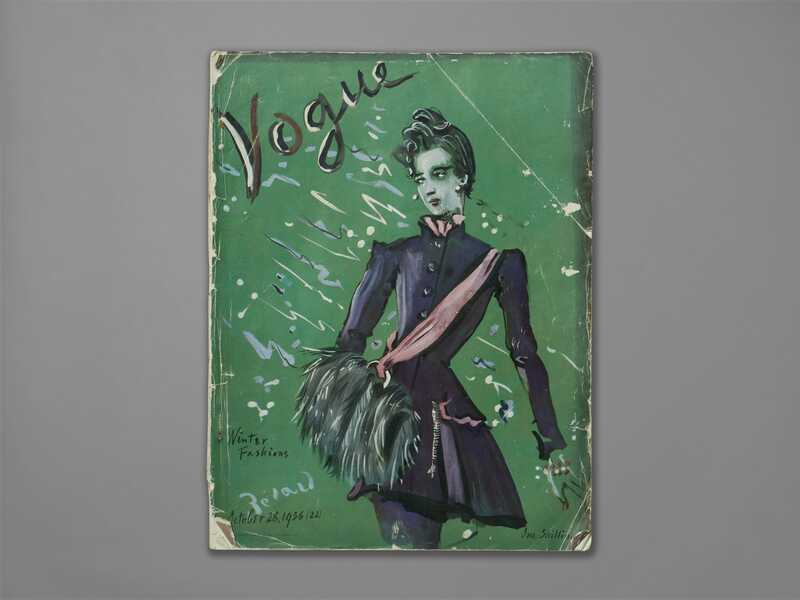 Bérard’s Vogue model is dressed in a manner that reflects the historical references and revivals that were abundant in fashion throughout the 1930s, and that were often inspired by popular films set in the past. The jacket of her suit forms two triangles, their bases its hem and the broad shoulder line, echoing the silhouette of the late 1890s; the oversized muff looks back to the 1910s, which in turn were derived from 1790s muffs; her hairstyle is based on those of the later 1880s; and the sash on the sashes, or ribands, of various historical orders which could be seen, for example, in portraits of Queen Victoria.